Storyteller and theologian John Shea provides a unique commentary that's ideal for preaching, teaching, or simply meditating on the Gospels. His writing is poignant and conversational making this book a valuable tool for professional ministers, as well as for Christians who reflect on the Gospels for personal spiritual growth. Shea draws readers into the people and situations that Jesus encountered in ways that are evocative and inspirational. The resource is based on both the Catholic Lectionary for Mass and the Revised Common Lectionary, making it accessible across Christian denominations.
. . . bring[s] the spiritual wisdom of the gospels into dialogue with contemporary life. The strength of this text is its literary approach . . . a second strength of the text is the author's genius for theological reflection . . . a third strength of this commentary is the spiritual wisdom that is imparted. This commentary has potential as a resource for small faith communities, RCIA groups, faith based counseling, and as a tool for spiritual direction and spiritual mentoring. John Shea's excellent guide to the Year C Sunday Gospels is marked by the author's training as a theologian and his gifts as an author and storyteller. 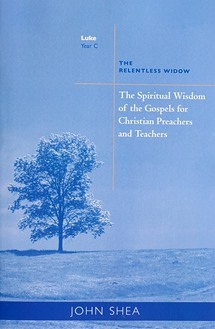 Although the title identifies the audience as Christian preachers and teachers, this resource is a must-have for all who wish to delve deeper into the Sunday gospels.
. . . a genuine exercise in spiritual and pastoral reflection informed by the biblical text, thereby enabling the book to serve as solid spiritual reading or homily preparation, or both. Storyteller and theologian Fr. John Shea STD provides a unique commentary that's ideal for preaching, teaching or meditating on the stories. His writing is poignant and conversational, making this a valuable tool for professional ministers, but also Christians who reflect on the Gospels for personal spiritual growth. Shea draws readers into the people and situations that Jesus encountered in ways that are evocative and inspirational.
. . . Shea offers practical ways to teach the spiritual wisdom.